Amur, a Siberian tiger, and Timur, a goat, in Safari Park in the village of Shkotovo. A heart-warming story of the friendship between a tiger and a goat, almost straight out of Aesop's Fables, has become a global phenomenon. 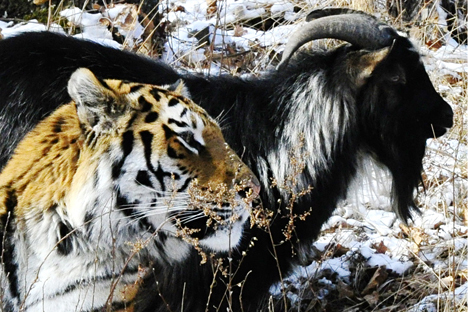 A wildlife reserve in Primorsky in Russia's Far East has seen a friendship blossom between a tiger and a goat. The unlikely yet heart-warming friendship, some even call it a “bromance”, has captured imaginations across the world. The tale of the predator Amur, who preferred friendship to eating Timur the goat for lunch will soon be beamed worldwide once web cameras are installed at the Primorsky safari park. We outline some lessons to be learnt from the animals that became unnaturally good friends. Timur the goat's exceptional bravery is incredible. It would appear that it never occurred to the little goat that he had been brought to the park as a victim; as fodder for the predator. His initiative, courage and interpersonal skills have turned the intended scene from victimhood to friendship. A readiness to make new friends and try new things was the starting point for this touching story of friendship, which began with curiosity and reciprocal interest of both the animals. Timur’s impudence has driven his new friend Amur out of the tiger’s den. Having occupied the sleeping space of his striped friend, the goat enjoys the status of the host, while the tiger has to snooze on the ‘upper berth,’ or roof of his dwelling, and look for space in the expanses of the safari park during the daytime. The freedom-loving Amur has to share his territory with Timur; who was originally supposed to be his lunch and now enjoys the perks of a lord of the park. Naturally, there is an occasional display of hysterics, but, all in all, Amur manages to cope well with his emotions. If Amur ignores Timur, doomed to while away his time alone, the plucky goat is not offended. He simply stands guard over the sleeping tiger. Love and hate are just one step apart. Timur and Amur have become an example that this worldly principle works both ways: sometimes we can spy a friend in our natural enemy. Let’s hope that the balance does not suddenly revert - and Timur one day end up as plat du jour for his big cat friend.